Italian Hot and Spicy 10″ pizza | What's for dinner? We were meant to be having a Moroccan chicken recipe recommended by my lovely sister, but Sainsbury’s had run out of chicken breast fillets. So I went scrounging on the discount shelf and found a £3.59 pizza discounted to £1.20 (love shopping after work on a Friday). Add a bistro salad with lamb’s lettuce, chard and shredded bistro and a ball of mozzarella to make an insalate caprese and you’ve got a bargainous pre-theatre dinner for less than £4 for two. 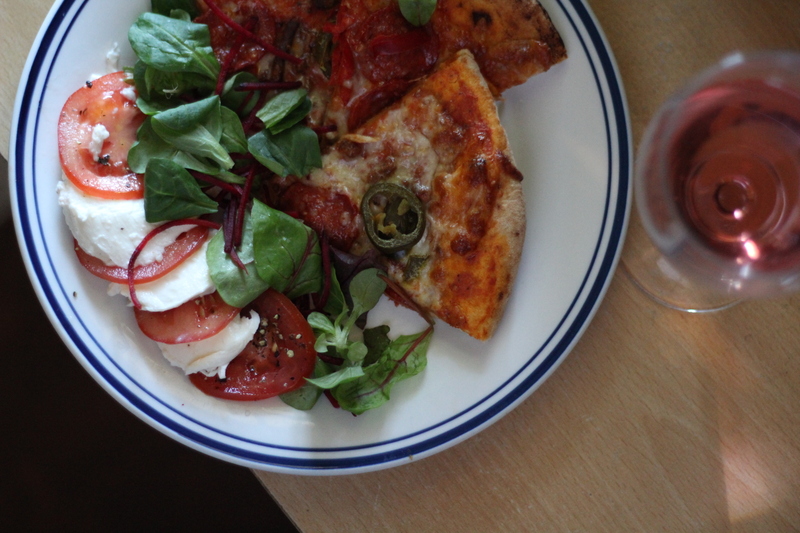 The creaminess of the mozzarella is a fabulous counterpoint to the heat of the jalapeño, and both of us added more bistro salad to our plates. All cooked and scoffed with plenty of time to get to the New Theatre for a fabulous production of Jungle Book, with amazing costumes. I’m currently Raksha for a local cub scout pack and will become Akela at camp in the summer, so it was fabulous to see the way their characters were played out on stage – and the elephants at the end were beautiful. Let me know what you think in the comments section?